L.S.C.™ has the highest count of colony forming bacteria, per application on the market today. 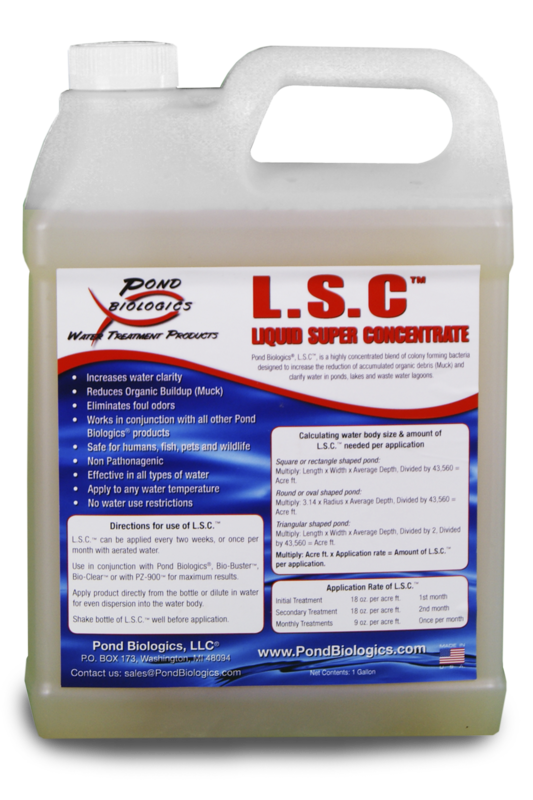 L.S.C.™ is a highly concentrated active liquid culture designed to enhance biological degradation and rapid reduction of organic matter, resulting in improved water quality, clarity and sediment reduction in your pond or lake. L.S.C.™ can be used in earth bottom Farm Ponds, Lakes, Water Gardens, Ornamental Ponds and Waste-Water Lagoons. LSC™ is not a chemical. It is safe for humans, livestock, pets, fish, agricultural water ways and has no water use restrictions. Apply once per month, to any water temperature! Combine Pond Biologics® Products & LSC™ for Clear Water, Reduced (Muck) Sediment and fast results! In ounces of LSC™ Initial application: 18 ounces of LSC™ per acre foot of water, for first two months. Monthly maintenance application: 9 ounces of LSC™ per acre foot of water, once per month, following the two initial applications. Shake LSC™ bottle well. Mix dosage amount in a clean 5 gallon bucket, with pond or lake water, apply mixture in a few spots around the perimeter of the water body. It’s that easy! This product is NOT water temperature specific.